My host and Kiva´s partner organization Banco D-MIRO provides over ten different types of microloans to borrowers in and around Guayaquil: among them loans to finance housing improvements, school expenses, medication, and loans awarded specifically to employees, young clients with a business idea but no experience, and – as Ecuador´s only microfinance institution – discount loans for HIV-positive micro-entrepreneurs. Yet, one borrower group beats all other borrowers in their dedication and commitment to paying back their loans on time: the well over 400 disabled borrowers of Banco D-MIRO, whose payment discipline has turned “their” loan – “Producto Creer” (“Product Believe”) – into the most successful and inspirational product of D-MIRO´s extensive spectrum. The delinquency rate of Producto Creer is by far lower than that of any other major micro-loan type of Banco D-MIRO, which means that borrowers of Producto Creer are better at paying back their monthly rates than any other client group! In these times of economic and social turmoil, Banco D-MIRO´s Producto Creer may be a much needed reminder that it may pay off for banks to do the morally right thing. One of the great joys and privileges of being a Kiva Fellow is to go along with loan officers when they are meeting Kiva borrowers and new clients. One of my most memorable outings was a visit of an HIV-clinic in a public hospital in Ecuador´s largest city Guayaquil. In the first part of this blog post I recounted how I drove with Nahin Alvarado from Banco D-MIRO´s headquarters on Guayaquil´s Isla Trinitaria to the HIV-clinic at Hospital Abel Gilbert. Nahin is the bank´s loan officer specializing in HIV-positive and/or disabled clients who have the right to receive a discount micro-loan. 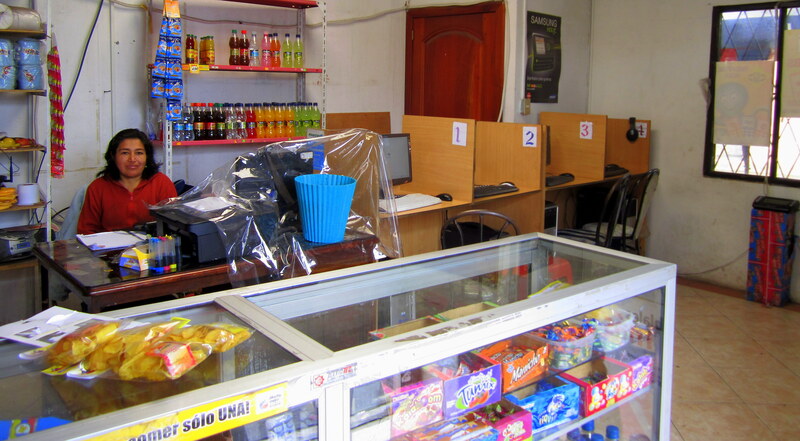 And Banco D-MIRO is the only micro-institution in all Ecuador to provide financial products especially for these two long-excluded client groups. While Nahin is presenting the bank´s special loan products to the patients in the HIV- clinic´s crowded waiting room, Franklin walks towards me. A strong man in his forties, Franklin is the leader and community organizer of FUSAD (Frente Unido por la Salud y los Derechos – in English: United Front for Health and Rights), a self-help and support group for HIV-positive people, based at the hospital and well known for the professional education courses they provide to their members. “Don’t be scared to shake the hand of a client with HIV or to drink out of his glass. You cannot get infected that way.” This was the message that Nahin Alvarado repeated over and over during a training session in September with a group of twelve new and somewhat incredulous loan officers of Banco D-MIRO, when I first met him. A loan officer himself, Nahin has been with Banco D-MIRO for over two years, focusing on two very special client groups who – not just in Ecuador – have long suffered from discrimination and lack of access to financial services: micro-entrepreneurs who are HIV-positive or disabled. The moment I heard Nahin so forcefully speak up on behalf of HIV-positive clients, I knew that I wanted to spend a day with him in the field. As much a therapy session as a blog entry, this is the narrative of a recent robbery incident in Guayaquil: It happened two hours ago and my co-workers and I can still feel the shock in our bones. This day had begun like a normal day: At 7.30am Rubi Chaca – the Kiva Coordinator of Banco D-MIRO -, her 16-year old intern Joel Kenny Matias, and I had met outside of the bank´s headquarters, where we were picked up by Roberto, the official driver of the bank. He drove us to the branch office of Guasmo where we gave a training session to the local loan officers, reminding them about Kiva and explaining to them why it is so important that they keep finding micro-entrepreneurs who agree to be listed with their name and photo on Kiva´s website. Only recently I learned that my host and Kiva´s partner organization Banco D-MIRO has its own company song! It combines a memorable piece of poetry with a rather inspired composition. A recording follows!